← PBJ Video – Really, Really! Yeah, it’s been a while, almost two months. My bad. Let’s dive back in, shall we? In summary: New York City had a life of it’s own in my head. In early August 2016, I visited there for the first time. On the first afternoon we visited Central Park and were there for hours, despite the jet lag. Day One started with a tour of the Intrepid and the Space Shuttle Enterprise, followed by the full two and a half hour cruise around Manhattan – south down the Hudson River into the Upper Harbor, up the East River under the “BMW” bridges, past Midtown and the UN, into the Harlem River, back south into the Hudson River, underneath the George Washington Bridge, past Grant’s Tomb., and finally back into port. Once we got ashore we needed to boogie and get across the city. 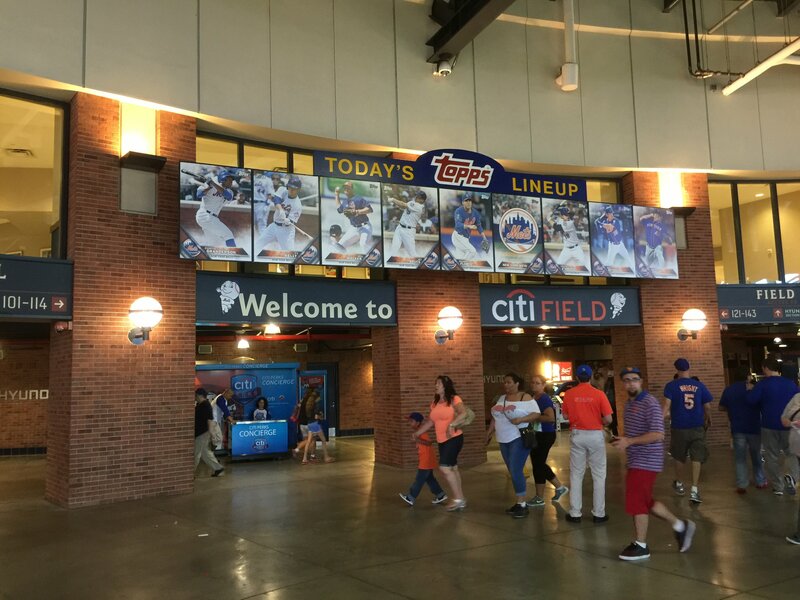 One thing we always try to do when we travel is to visit the various major league baseball parks. 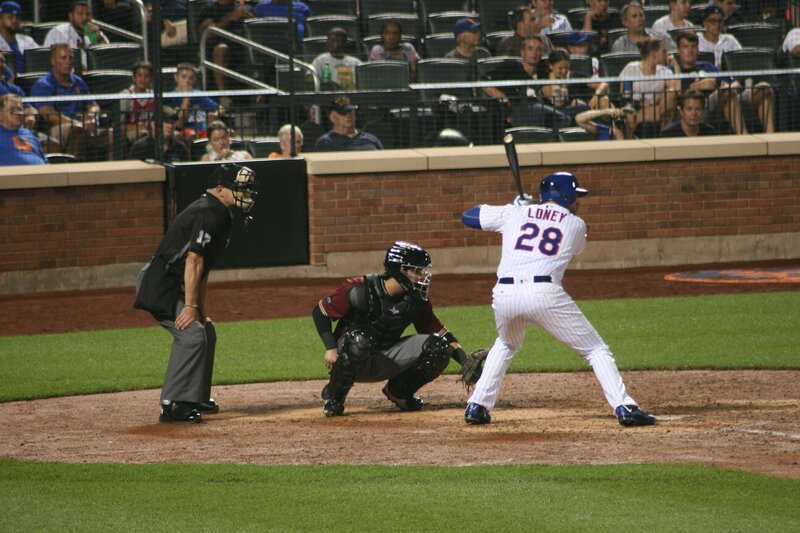 On this night, we had tickets to see the Mets. There’s a story there, but I’ll save it lest this post get so long that it never, ever gets done. 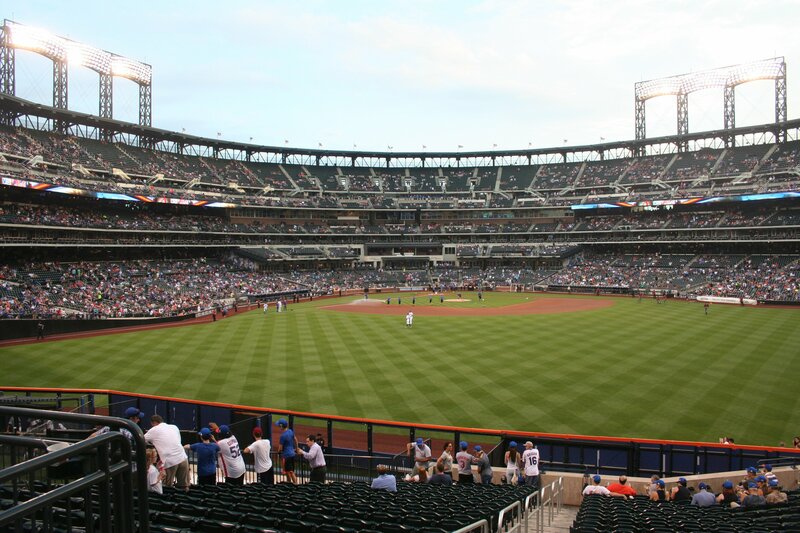 Having never been to New York before, I never got to visit the old Shea Stadium. 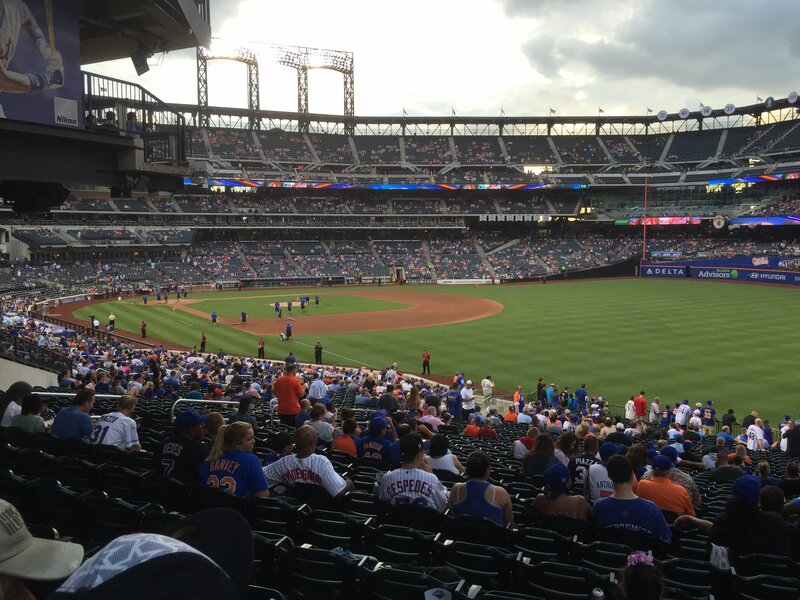 But CitiField is lovely. From where we got dropped off by the cab we entered the stadium in a fairly hum-drum entrance (not this one!) down one of the foul lines. Once we found our seats, I wandered off, as is my wont, to see as much of the stadium as I could, bag o’ cameras in hand. 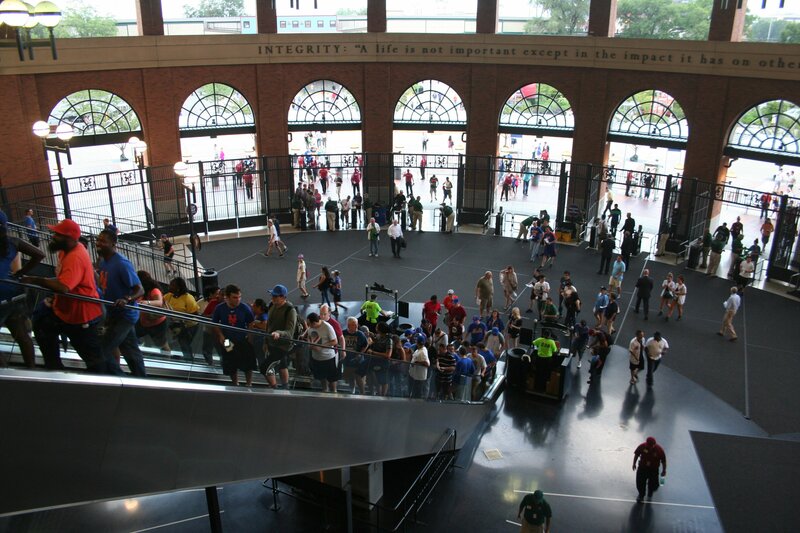 That’s when I found the grand, main entrance right behind home plate. The on-again, off-again rain that had followed us all day (see the pictures from the Intrepid and the cruise around Manhattan) was decidedly on again. 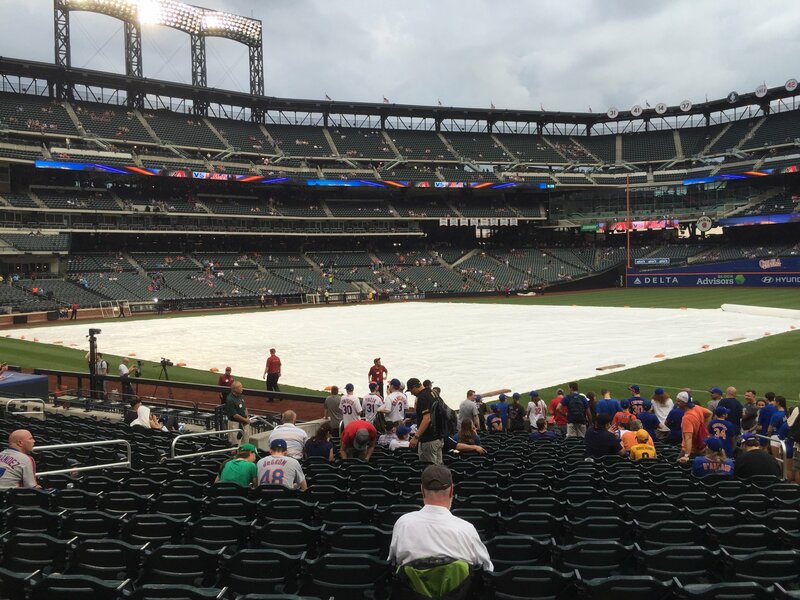 We found the tarp to be on the field when we got there, an hour or so before game time. But it wasn’t too long before the grounds crew came out and started getting the field ready for play. 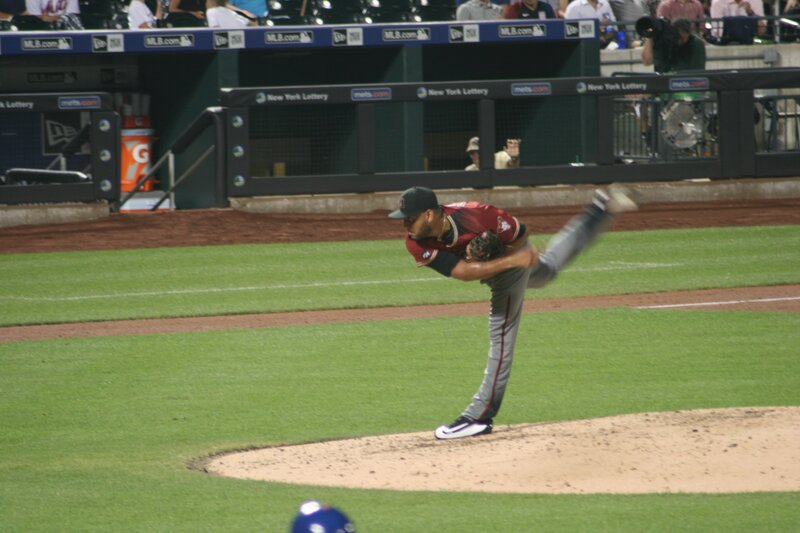 The start of the game was delayed by about thirty minutes, but we did get it in. Wandering about like this in new and unfamiliar ballparks, I find that the security people and ushers are generally cooperative and polite if you are. Say howdy, let them know it’s your first time here, you’re a tourist from out of town, ask for permission to go down into this section where you don’t have a ticket because you just want to take a couple of pictures, and you’ll be fine. The big apple (see what they did there?) is a leftover from the Mets’ earlier life at Shea Stadium. It was iconic and got moved to the new stadium, of course. 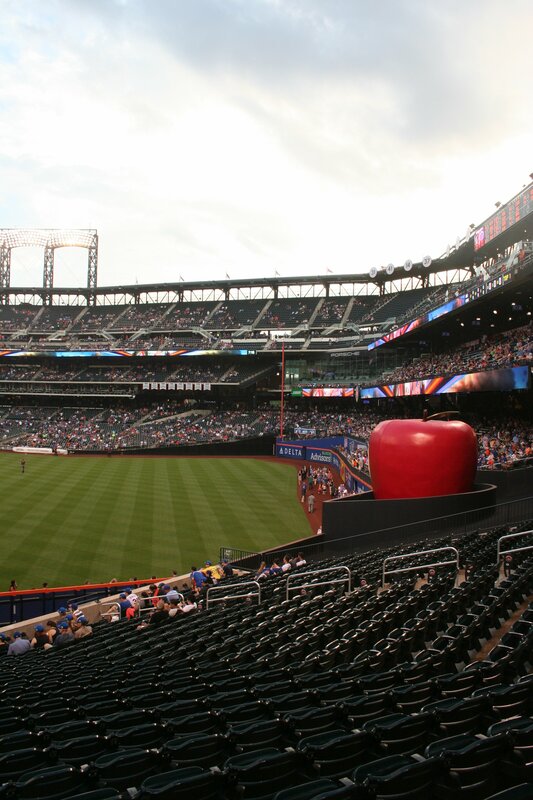 During the game it’s down inside that huge well, but when a Mets batter hits a home run, up pops the Big Apple! I don’t remember seeing that happen while we were there. Next trip, maybe. 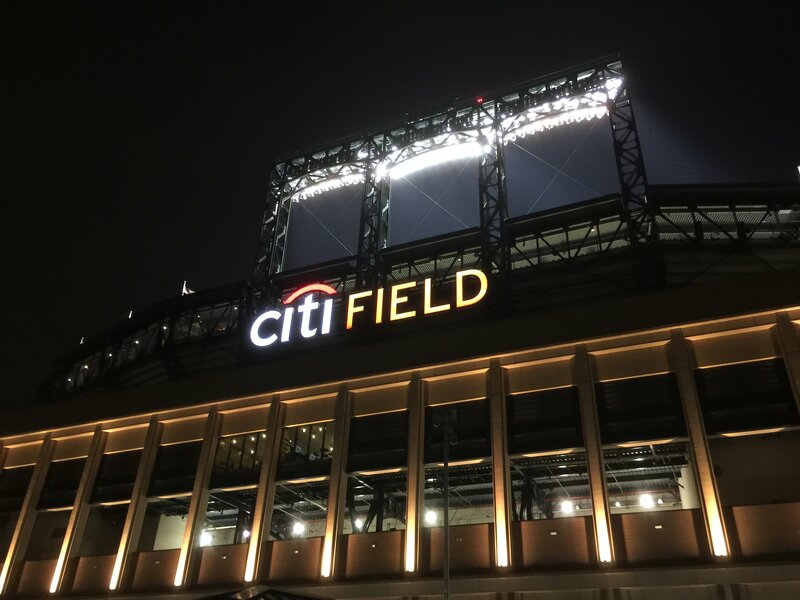 Given the late start, the full and busy day we had behind us, and the fact that we were both jet lagged still, we did something we almost never do at a baseball game – we left before the end of the game. The Diamondbacks had scored a run in the top of the eighth to go up 2-0, and the Mets had done nothing in the bottom of the eighth. Given that we were going to need to find a cab to get back home on top of everything else, we decided to beat the crowd a little bit and bail. Which leads us to the second story of the night, which I will share with you…soon.